One of the most common causes of fire-breakouts in America is faulty dryer vents. Dryer vents also remembered as heat and smoke vents are an essential installation in residential and commercial buildings for protection against fire. They are also called “gravity vents” because they let out the smoke and heat through the roof by a buoyant action when a fire breaks out. It’s common to see lint building up in dryer vents over extended use because the collector’s functionality reduces. Fire breaks out in buildings mostly because of dust or debris clogging the dryer vents, causing unimaginable damages to life and property. Faulty gas dryers are even more dangerous because they emanate carbon monoxide fumes, which can prove fatal for people breathing it. Lint build-up in ducts of dryer vents restrict airflow, increases drying time, and ultimately leads to overheating of the motor. This lint present under the dryer is prone to catching fire, not to forget, the air draft can draw the fire into the air duct. Blocked or lint-coated ducts can quickly lead to house fires, which is why it’s essential to maintain them properly. The National Fire Protection Association (NFPA) suggests that every residential and commercial building should undergo a proper cleaning of dryer vents once a year. At the same time, clearing off lint from dryer vents is not a layman’s job. You need professionals to do the job for you. Texas Duct Pros, the professional company that’s upholding safety and protection of residential and commercial buildings with its state-of-the-art Fort Worth dryer vent cleaning services. As a service company, we aim to protect property owners from the perils of faulty dryer vents and create a safe space for everyone to live in. It’s a technical arena, but you shouldn’t worry about navigating it because Texas Duct Pros will be by your side always. We also offer duct installation services, insulation, restorations, Water damage, fire damage, tile and grout along with air duct cleaning services for residential and commercial needs. At Texas Duct Pros, we maintain a team of expert technicians who are highly dedicated towards dryer vent cleaning in Fort Worth. Our technicians come from electrical and mechanical engineering backgrounds, which arms them with the knowledge of different types of dryer vents. They have been working on these systems for years, thereby allowing us to bring together their years of experience for serving you the best. The industry we operate in is a dynamic one, where changes take place every single day. What worked years back may not work in the present. This is the reason why we focus so much on upgrading the skills of our team. We conduct regular training and workshops to open different learning avenues for our team and bring them at par with the latest trends. Trust a professional to get the job done right. Call us today to schedule your dryer vent cleaning service. Our technicians will analyze your dryer vents thoroughly and suggest a proper cleaning strategy. They will remove the build-up of lint and clean up the trap with the help of appropriate equipment. We will measure the flow of air using a specialized meter to ensure that the dryer vent is working correctly again. We clean the back of dryer topically to remove the excess accumulation of lint. We use a video inspection system to check the dryer vent and the wall-to-equipment ducting to compare out before and after results. Any blockages in the air duct are removed using a HEPA vacuum system. Our dryer vent cleaning services are all-comprehensive and take into consideration every material part of your dryer vents. Our expert technicians have a good eye for detail, ensuring that every component is serviced to improve the system’s functionality and strengthen your protection against fire. Whenever you see your dryer producing more heat than usual or taking longer to dry, call us for help. You can make your dryer vent run more efficiently with our dryer vent cleaning in Fort Worth. 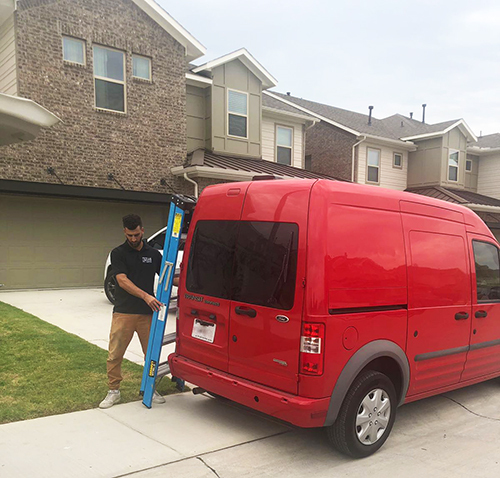 Get in touch with us at (469) 242-2296 to get an estimate.